During my 4th and final year of surgical training at Charity Hospital in New Orleans, I was fortunate to receive the one and only political appointment of my medical career. Because of my personal friendship with Dr. Charles Mary, the Hospital Director of Charity, I was appointed as an Assistant Clinical Director for the hospital for the year 1968-1969. I served with 2 other physicians, Dr. John Buck and Dr. George Cook that year. It was quite an honor because Charity Hospital was the largest hospital in the United States at the time, and there was a staff of approximately 250 resident physicians employed by the hospital. 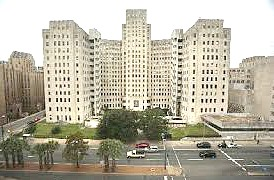 The two medical schools in New Orleans; LSU Medical School and Tulane Medical School used Charity Hospital as their teaching hospital, and the hospital was evenly divided between the schools. There was tremendous competition between the services and each service thought they were the best. All three of the ACD’s (Assistant Clinical Directors) were on the LSU Service for that year. The simple explanation is because Dr. Mary had been an Internal Medicine resident on the LSU Service prior to his appointment as Director by Governor John McKeithen. I had gotten to know Dr. Mary as an internist since he had referred many surgical patients to me for 3 years, and we had a very good working relationship. The reason Charity Hospital had been so steeped in politics is because at the time the annual operating budget of the hospital was approximately 30 million dollars, fully funded by the state of Louisiana! That was more than the total budget of some states in those years. Charity Hospital had been on the center stage of Louisiana politics for almost 100 years, and every governor had some agenda regarding the hospital. The responsibilities of the ACD were not complicated but required the ability to get along with all (most) of the doctors on staff, and the skill to settle disputes. LSU and Tulane doctors were constantly squabbling over which patients should be assigned to their service. There were some patients whom each wanted and some that neither wanted and there was a daily turf war which had to be settled. The Hospital Director assigned those battles to his ACD’s. He was busy with budget meetings, high level administrative duties and meeting with all the political big-wigs of Louisiana. Every night the ACD was the acting Director of the hospital, and every administrative decision was made by him alone. Most decisions were routine but occasionally a decision would have far-reaching implications. Every third night I was on-call as ACD, and frequently the responsibility coincided with my duties as the 4th years surgeon on-call. This was before the days of cellular phones, but we used a beeper system which was considered high-tech then. When I had a call from the hospital operator, my beeper would sound, and I would then call the operator to receive my call. It sounds very antiquated with our current technology, but it was a wonderful system allowing us to take call from home and also have the freedom to go to a restaurant or to a movie. The first time Cathy and I attended a movie with my new beeper and it went off, it caused great alarm to most people in the theater who had never heard such a sound! As ACD, I frequently got phone calls from politicians and state officials who wanted some political favor from the hospital. I once received a call from Governor McKeithen who wanted one of his friends with no medical insurance admitted to the Doctor’s Infirmary. The Doctor’s Infirmary was in a special section of the hospital and was used primarily to provide medical care for the staff and occasionally for outsiders. Every room was a private room and the care provided was as good if not better than any hospital in New Orleans; plus with the unique added benefit– it was free! Every patient had their own nurse and the only doctors allowed to treat patients in the Infirmary were the 4th and 5th year residents along with the full-time staff physicians. One of the most interesting calls I received all year was from a newspaper reporter in Paris, France. In his deep French accent he asked if I could give him any information on a then well-known opera singer who reportedly was a patient in Charity Hospital. I took the caller’s name and number, and said I would call when I could provide the needed information. I discovered after lengthy research, that indeed the opera singer was a patient on the Psychiatry Service under the name “John Doe.” He had been drinking large amounts of alcohol in numerous bars in the French Quarters, and had been found lying unconscious on Bourbon Street. For whatever reason he had no identification papers, so was brought to Charity Hospital and admitted to a general ward under the John Doe name. When he awakened several days later, he did not know who he was nor any details of his life and was transferred to the Psych. unit for rehabilitation. His memory very slowly returned, and by the time I received the call from the Paris reporter, he was beginning to piece his life together. After I gave my report to the Paris newspaper, the story made international news, because the singer was so well-known in the opera world. I began receiving other calls for similar information concerning him.